Boss Abdulaziz Al Anbari has admitted tension caused by Sharjah’s long wait for Arabian Gulf League glory has heaped on “big pressure”, even though a 3-2 victory against Al Jazira puts the dominant leaders ever closer to an unprecedented unbeaten title success. 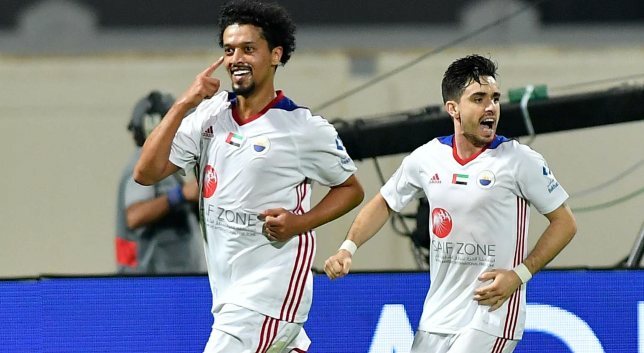 Friday’s trio of first-half goals at Khaled bin Mohammed Stadium, of which a third from veteran Mohamed Al Shehhi would prove decisive, helped maintain course for a shock first top-flight triumph since 1995/96. “Thank God and thank him for the result and our luck against Al Jazira,” said Al Anbari, whose cause was helped by a motivational speech from key midfielder Otabek Shukurov who was seriously injured on Uzbekistan duty during the international break. “We had some difficulties, but we succeeded in exploiting these opportunities and I congratulate my players for both the win and performance. “There is big pressure in the league due to the fact the team hasn’t won one for many years. This makes us retreat at certain times of the game, and we must be careful not to lose focus in the final minutes. In the opposite camp, frustration abounded. Jazira conceded two penalties within the first 10 minutes and could not build on ex-UAE centre-back Fares Juma’s 53rd-minute strike to make it 3-2. “We dominated the game with possession and kept Sharjah’s attackers, who are very skilful, relatively quiet,” said coach Damien Hertog. “We knew we had to be at the top of our game against Sharjah and we were as a team as I cannot fault the efforts of the team performance. Sharjah next travel to Ajman on Thursday, while Jazira host second-placed Al Ain on Wednesday. 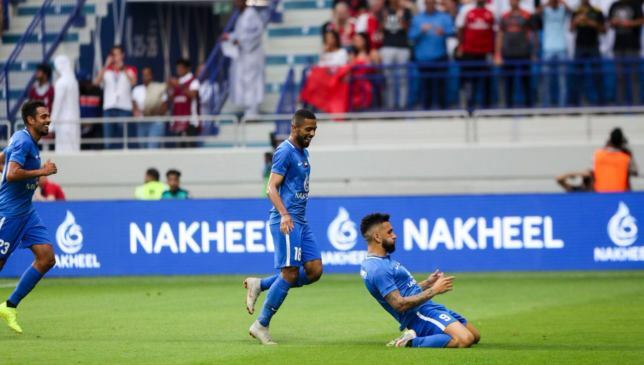 Al Nasr threw everything at visitors Arsenal and were by far the better side for 45 minutes before succumbing to a 3-2 defeat as they opened their new Al Maktoum Stadium in fine fashion. The Blue Wave christened their new home in suitable style with a goal fit to grace any game. They’d started brighter and got their reward when Chilean Ronnie Fernandez heated the game up with a sumptuous curling effort that beat a despairing Bernd Leno and went in off the inside of the post. Arsenal, second best throughout the opening 45 minutes, equalised via Denis Suarez’s exquisite vision. He picked out Carl Jenkinson’s run and after the much-maligned right-back’s first effort cannoned off the upright, he thumped home the rebound. A raft of changes – all 11 players were replaced at the break by Nasr boss Benat San Jose – seemed excessive given their first half showing. But when Arsenal are in town, everyone wants some of the action and they paid thereafter as Alexandre Lacazette put the Premier League giants 2-1 ahead before Tyreece John-Jules scored the killer third. The hosts had something to cheer about late on when Rashed Omar was bundled over and Khalid Jalal calmly stroked home to make it 3-2. Ahmed Shambieh 6: Flapped at a few crosses and looked a bit nervous, but came out early to deny Lacazette. Ahmed Ibrahim 7: Typified Nasr’s belief as he got forward to join attacks. Had trouble keeping tabs on Medley and Suarez though. Masoud Sulaiman 7: Formed a brick wall alongside Oumari as Arsenal struggled. Could have had a goal too, his header blocked by Leno’s knees. Joan Oumari 6: Lebanon veteran let Lacazette know he was there early on with a clattering challenge. Bossed things at the back otherwise. Mahmoud Khamis 7: An expressive player and he used this big stage to show us his stuff. Gave Jenkinson a torrid time as he marauded forward. Junior Dutra 7: Quiet start, surging run down the right led to the opening goal. Showed poise to cut ball back to Fernandez. Amer Mubarak 7: Thrived against young midfield opponents who were surprised by Nasr’s insurgence and energy. Tariq Ahmed 7: Tenacious and energetic as ever. Showed brilliant feet to trick Lacazette to get out of a tight situation in his own box. Alhussain Saleh 8: Nasr were enjoying a lot of joy down both flanks, largely due to the excellent work of the lightening quick Saleh and Dutra. Alvaro Negredo 7: The Beast lived up to his name, proving a handful for Arsenal’s defence. Couple of early sighters. Wasteful. Could have had a hat-trick…against Arsenal. Ronnie Fernandez 8: Really good movement up front. Should have scored inside 60 seconds but shot tamely at Leno. A thorn in the side. Opened scoring with a stunning strike. Mohamed Marzouk 6: Got a slice of the action but had a job patching up an increasingly dishevelled defence. Yousef Jaber 6: Endured a tough time as Arsenal’s raft of rapid replacements ran Nasr ragged. Ahmed Jashak 6: Slotted into midfield and even though his side were looking leggy, he pushed forward. Ali Hussain 6: Tried to pin down an increasingly rampant Gunners’ midfield. Khalid Jalal 7: A raft of changes made it difficult to maintain any rhythm but he patrolled midfield admirably. Converted his penalty stylishly. Rashed Omar 7: Good energy in the final third as it crumbled behind him. Bundled over for the late penalty. Mohamed Bouherrafa 5: Looked off the pace, roasted by Maitland-Niles. Ibrahim Essa 6: Replaced Shambieh and had a busy outing, helpless for both goals conceded. Khamis Esmail 6: Surprised to see an Al Wasl player putting on the Nasr blue. Tried to take Cech by surprise with a long-ranger. Wide, but only just. Saeed Sowaidan 5: Came on and lasted 20 minutes before being forced off. Mohammed Fawzi 6: Veteran slotted in at right back and didn’t do much wrong. The UAE players will get another chance to stake their places in Bert van Marwijk’s future plans when they meet depleted Syria. Van Marwijk, 66, was confirmed as successor to Alberto Zaccheroni last Wednesday and was in the stands at Abu Dhabi’s Al Nahyan Stadium 24 hours later to witness a come-from-behind, 2-1 friendly win against former employers Saudi Arabia. The 2010 World Cup finalists with his native Netherlands is also expected to be in attendance for Tuesday’s second – and final – clash of this international break at Mohammed bin Zayed Stadium. Star attackers Omar Khrbin, of Egypt’s Pyramids FC, and Omar Al Somah, of Saudi Arabia’s Al Ahli Jeddah, will both be absent for the visitors to Abu Dhabi. This has not, however, stopped caretaker boss Saleem Abdulrahman from reiterating the importance of this phase for a nation that is still recovering from a harrowing semi-final exit on home soil at January’s Asian Cup. He said: “We are seeking to win the trust of our fans, restore confidence and cheer up the players. This is especially true for the young players, who join the team for the first time. Al Ain right-back Bandar Al Ahbabi and Al Jazira predator Ali Mabkhout got the goals in nine second-half minutes to defeat a second-string – at best – Saudi Arabia. 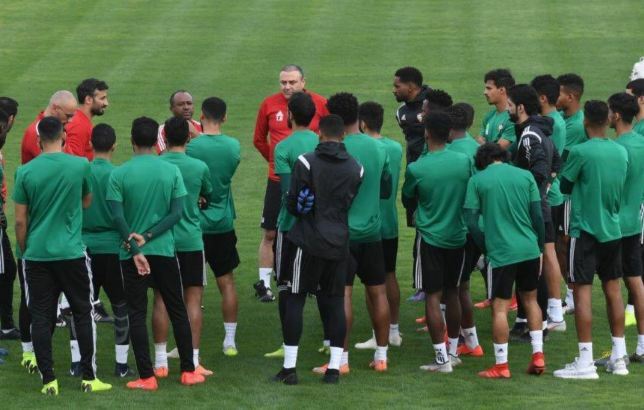 The UAE will again be without their sizeable Shabab Al Ahli Dubai Club and Al Wahda contingent because of last Friday’s Arabian Gulf Cup final, plus their brightest young talents because of ongoing AFC U-23 Championship qualifiers. This could see continued opportunities for the likes of Al Nasr midfielder Habib Fardan. The 28-year-old started, against the Saudis, for the first time since August 2016. الأبيض يواجه سوريا وديا غدا في ستاد محمد بن زايد ..